I know we're still a few weeks away from summer, but it's time to start thinking about your summer beauty routine. I'm a firm believer in wearing something with SPF every day, even in the winter, but it's even more important to use an SPF on your face in the summer. I know you want a sun kissed glow, but in 10 or 20 years, you'll be so thankful that you faked your glow and kept your face protected from the sun. I try to use a moisturizer with an SPF, but I've found some moisturizers that I love that don't have any SPF in them. 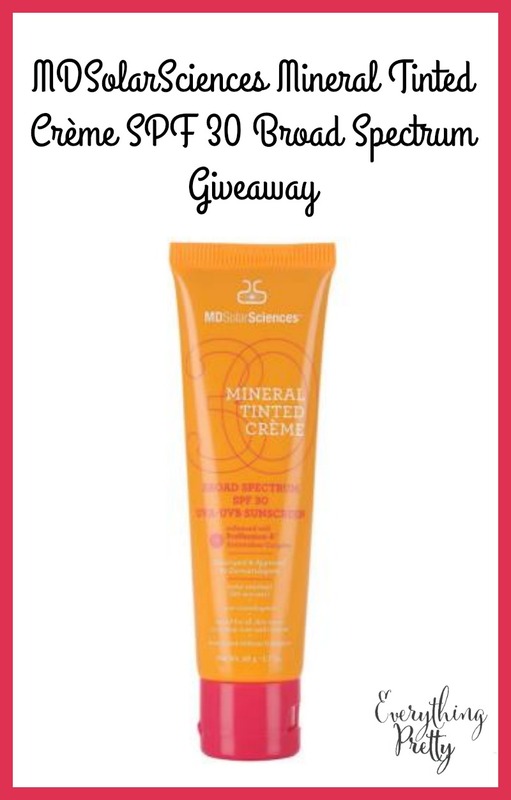 I don't want to use sunscreen for the body on my face, but luckily Lovely Skin sent me some MD Solar Sciences Mineral Tinted Creme, and they are offering one tube for one of my lucky readers! The MDSolarSciences Mineral Tinted Creme has an SPF of 30 and antioxidants to protect your skin. It's a lightweight formula, so it feels comfortable on your skin. The matte finish is great by itself, or you can use it under foundation if you'd prefer. This creme is a great way to add SPF to your skin care routine if your favorite moisturizer doesn't have it! As with all sunscreens, you'll need to reapply this if you'll be wet or sweating for more than 80 minutes, after towel drying, or every two hours. I am loving this creme because it's so lightweight. Some days I wear it by itself, and other days I add foundation. Either way, it gives me a beautiful base for my makeup. What to win one for yourself? Lovely Skin has agreed to give one of my readers the MDSolarSciences Mineral Tinted Creme! Giveaway open to US residents 18 and older.